This meatless Monday recipe has been sponsored by SC Johnson but all opinions expressed here are my own. The standard American diet, when compared to other cultures, includes a lot of meat. That being said, expanding our taste palate to include recipes from other countries will help to not only reduce our meat consumption, but our carbon footprint as well. Leaving meat out of your diet helps reduce the amount of greenhouse gas emissions that are released into the earth. Next time you’re out shopping, visit the international aisle at your local grocery store to get a sense of the various foods and flavors offered across the nation. My personal favorite international cuisine is Thai. 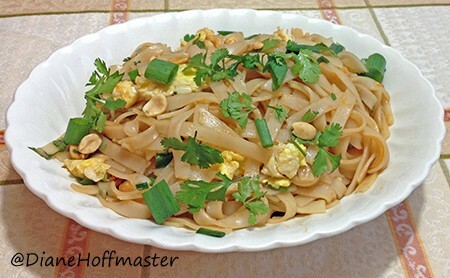 Come check out my Vegetarian Pad Thai recipe on the SC Johnson Greener Choices blog if you want an easy Meatless Monday recipe!